Q. What do the terms "internal load dissipation" and "matched power rating" mean? A. The matched power rating specifies the maximum power level that can be applied to the input when the output ports are terminated with the specified load resistance. The internal load dissipation refers to the power rating of the internal terminations within the power divider. This level is given because improperly matched terminations on the output ports can result in reflected signals that could exceed the power limits of the internal terminations. The matched power rating is usually several times higher than the internal load dissipation. Q. Can performance parameters be traded off when specifying power splitter/combiners? A. Once frequency range has been designated, there is not too much leeway in tradeoffs between the various spec parameters. Usually all the performance parameters of a well designed power splitter simultaneously fall off as a function of frequency. However, near the band edge, isolation may be improved at the expense of VSWR by adjusting the value of the internal load resistor Z0. Q. What factors influence the power rating of a power splitter/combiner? A. The power-handling capability of a power splitter/combiner is basically determined by the internal resistor across the transformer and the transformer's core and wire size. When used as power splitter, the core of the transformer may saturate at the lower frequency end of the operating band if the designated power rating is exceeded; an increase in insertion loss will result. In a power combiner application, the power loss across the internal resistor determines the power rating of the power splitter/combiner. If two signals at different RF frequencies, are being added; then each signal will appear at the S port with a 3 dB loss. The internal resistor absorbs the 3 dB power loss for each signal. Note: If the two signals were equal in phase, and the power splitter/combiner were a 2 Way 0° type, there would not be a 3 dB loss for each signal and thus the power rating of the power splitter/combiner would be increased, and limited by the wire size of the transformer. Q. Suppose my application requires a power rating higher than a popular, low-cost "off-the-shelf" model. What can I do to keep costs down? A. If an application demands an internal resistor power rating larger than available as a standard catalog item, it is possible to request from Mini-Circuits a unit with a higher rating internal resistor or a unit without an internal resistor. Then a higher power rating resistor can be out boarded; of course, the performance of the final combination will depend on the external resistor's characteristics, the way it is wired, and its capacitance to the board on which it is mounted. In most applications this should not be a problem. Q. High isolation between output ports is critical in my application; insertion loss is not. Can I specify a power splitter design that trades one spec off for another? A. The key performance parameters of a power splitter are usually influenced in the same direction during the design stage. A well-designed power splitter will offer high isolation, low insertion loss and good VSWR. You don't design a power splitter for high isolation and poor VSWR, nor for high isolation with a poor insertion loss. However, the design of the power splitter can, by reducing the bandwidth of the power splitter, be optimized on this narrower frequency range and improved isolation characteristics can be obtained to satisfy your application. Q. I want to combine the output of two amplifiers. What parameter is most critical to spec? Q. 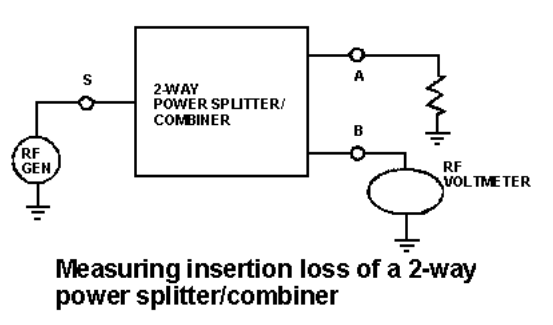 Is intermodulation distortion critical in a power splitter/combiner? A. Distortion in a power splitter is caused by saturation of the transformer, usually a toroidal type. With the present state of transformer technology, distortion is insignificant except at the low end of the specified frequency range where the ferrite core is providing most of the magnetic field. Q. I am making a two-tone, third-order IM measurement and the 2-way power combiner arrangement I am using does not provide adequate isolation for the low-level readings I am taking. What can I do? A. 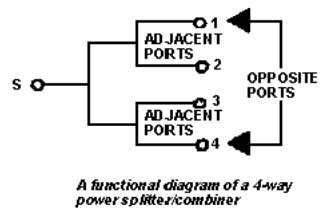 Use a four-way splitter/combiner instead of a two-way. A general characteristic of a four-way combiner is 20 dB or more higher isolation between opposite ports than adjacent ports. Therefore, terminate ports 2 and 3 and apply inputs to ports 1 and 4 to obtain up to 40 dB isolation. Q. 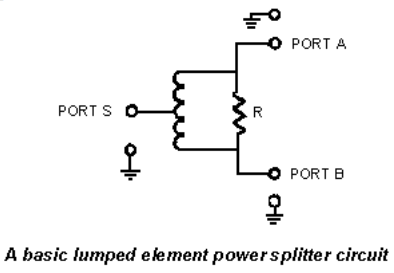 What effect will a slight mismatch at sum port have on power splitter/combiner isolation performance? A. Consider the situation in an ideal two-way power combiner where there is infinite isolation between ports A and B. A signal applied to port A will be routed to port S, minus a 3 dB loss. Since port S is properly terminated, the signal will be absorbed and nothing will be reflected back to ports A and B. Fine, as long as port S is properly terminated and thus no mismatch. Now let's consider a slight mismatch at port S. Assume a + 20 dBm signal is applied to port A. Since there is a 3 dB loss between ports A and S, the incident power at port S is +17dBm, ignoring any slight transformer loss. If a slight impedance mismatch exists at port S, which causes a - 20 dB signal reflection, then a signal of - 3 dBm (+17 dBm attenuated by 20 dB) is sent back to ports A and B. This - 3 dBm signal experiences a 3 dB loss as it is fed to port B, and the mismatch at port S has now resulted in a - 6 dBm signal at port B. Now the measured isolation between ports A and B is not infinite; there is a + 20 dBm signal at port A and a - 6 dBm signal at port B, for an isolation of 26 dB. In this case, one might incorrectly conclude the splitter has an isolation of 26 dB when in fact it is infinite. Q. I have been doing digital design work until last month when I was assigned to an RF project. My boss told me to test the isolation of a power splitter and to make sure port S was properly terminated. What does he mean "properly terminated?" A. 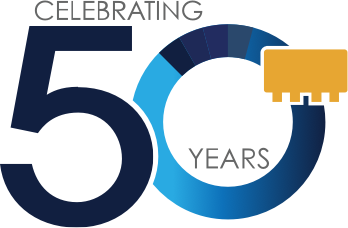 Ideally, a 50-ohm device should be terminated in a 50-ohm impedance so there will be no reflected power. However, in a real world situation, you won't find an ideal termination. So let's consider the consequences. If you used a 55-ohm termination, VSWR would be 1.1 (55/50) for a return loss of 26 dB. Let's see how this affects an isolation measurement. Assume a 0 dBm input from the RF generator at port A. First, the signal experiences a 3 dB loss traveling from port A through the power splitter and thus there is -3 dBm signal at port S. Now, due to the 1.1 VSWR, a - 26dB reflected signal (or -29dBm) leaves port S, experiences another 3 dB loss through the splitter and arrives at port B at a level of -32 dBm. Thus, the 55-ohm termination contributed 26 dB loss to the inherent 6 dB loss of a two-way splitter. Now, assume a "more perfect" termination of 51 ohms was used. Now VSWR is 1.02 (51/50) which produces a return loss of 39 dB, an improvement of 13 dB over the 55-ohm termination. Just how hard should you strive for a "perfect" match? Use this rule of thumb. 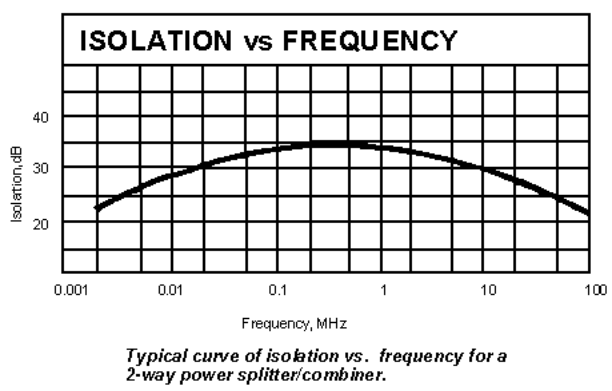 The return loss of the termination at S should be at least equal to the highest isolation you intend to measure; and remember, a 2-way coupler has an inherent 6 dB loss. Thus, if you wish to check a power splitter with a 30 dB isolation spec, the termination return loss should be at least 30 dB, requiring a termination VSWR of 1.06 or better. If you are concerned with a 20 dB isolation spec, a VSWR of 1.2 would be acceptable. Q. Will mismatch at either port A or B of a 2-way power splitter/combiner cause significant performance degradation? A. One of the main advantages of a power splitter is that mismatch at either port A or B is not critical if port S of a power combiner is properly matched. When current cancellation through the transformer and internal resistor is taking place, the effect on isolation between ports A and B is negligible. Let's take it one step further and assume port S and port A are properly terminated but port B is shorted. In a basic "T," a short across one input would obviously short everything. In a practical power splitter/combiner, if port A and port S are properly terminated, but port B is shorted, there will be a 2 dB or so loss at port A. This is because the signal fed to port B will be reflected back to port S. If the termination at S is not perfect then a reflected signal will appear at port A, adding to the original signal level at A, thus slightly reducing the loss between port A and port S.
Q. I need to accurately check the insertion loss spec of a two-way power splitter. How can I do it? A. A simple, popular (but not too accurate) approach is to terminate all unused ports with 50 (or 75) ohms. Next, set the RF generator to the frequency desired and measure its power output. Connect the generator to port S and measure the power at port A. The insertion loss is the difference between the two readings. Repeat for port B. A more accurate measurement involves the use of a calibrated 3 dB attenuator inserted between test points A and S, with the power splitter removed from the test setup. The output level of the RF generator is set so the RF voltmeter reading is near the top of the scale, its most accurate region. Then, the 3 dB attenuator is removed and the power splitter is connected to test points A, B and S. The difference between the first RF voltmeter reading and the new reading at point A indicates the additional insertion loss over the theoretical 3 dB value. Thus, the insertion loss of the power splitter under test is 3 dB plus the incremental reading. Repeat the procedure for port B.
Q. I am using a 2-way power splitter in a military system and must calculate the reliability of the splitter. What is its MTBF? A. Mini-Circuits 2-way splitters consist of two toroidal transformers, one ceramic NPO capacitor, and a hi-rel resistor exceeding MIL-R-10509. The ceramic capacitor reliability will be the determining factor in the reliability of the unit. Therefore, considering your application, refer to MIL Handbook 217 to make your calculation. Q. What is a two-way, 180° power splitter? A. A 180° power splitter provides two signals at its output - the signals are 180° out-of-phase with each other. Generally, one of the signals will be in phase with the input. Q. How can I tell if a 2-way power splitter/ combiner is operating properly? A. A 2-way power splitter should offer 25 to 30 dB isolation in its mid-band range. Measure the isolation with the sum port properly terminated; 25 to 30 dB should be read. Now remove the termination. If isolation drops to 6 dB, the power splitter is OK; if isolation is still high, there is an open circuit in the power splitter.